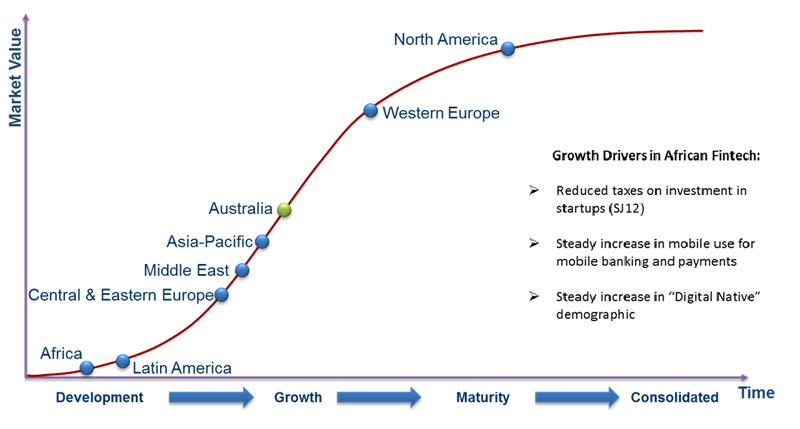 If you thought that the upside potential for FinTech growth -- and the likelihood of a big disturbance within the banking industry status-quo -- was limited to North American and Western European markets, then you would be mistaken. This very significant intrusion is truly a global phenomena. New research has uncovered data that suggests the FinTech sector in Africa is now poised for exponential and rapid growth that will challenge existing financial services providers, despite the fact that it's in the early stages of adoption relative to the rest of the world. According to a worldwide market study by Frost & Sullivan, the FinTech industry in Africa may experience a similar disruption seen in Australia -- a country with financial services development comparable to South Africa. A case in point: the financial sector in Australia is set to take $10 billion in revenues away from the big Australian banks and contribute $3 billion of new revenue from 2015 to 2020. "The African continent has embraced mobile communications at a faster rate than other parts of the world, while also pioneering mobile technologies such as M-PESA, through which almost 50 percent of payments are being made by Kenyans," said Wayne Houghton, director at Frost & Sullivan. Africa's under-developed banking infrastructure means that the FinTech wave will more likely be an enabler of financial inclusion than the typical disruption seen in more developed markets. With at least 60 percent of the adult population on the continent still without a bank account, Africa offers significant opportunity for the industry. Globally, an increase in the use of algorithm-based banking and robo-advice is set to significantly affect the financial planning market, and it's only a matter of time before these trends find application in Africa. Artificial Intelligence (AI) systems are already being used in social media networks to manage the digital ecosystems of established financial institutions, enabling a more uniform consumer experience among diverse types of services. For example, MyBucks is taking advantage of the power of AI systems to assess the credit-worthiness of customers in the African market, where the required data points for modeling default rates have previously been notoriously difficult to acquire. MyBucks and TagPay have already joined the growing list of international companies to have taken an interest in Africa's FinTech industry -- competing with local startups such as Kenya Fintech, SnapScan and Rainfin. According to the Frost & Sullivan assessment, their analyst predictions suggest that Apple Pay and Android Pay will be the next revolution in banking, with a number of bets being placed on the emergence of a Facebook bank. That being said, the global implications to the financial services sector could be a dramatic increase in new disruption from FinTech.